Editor’s note: Michel Camdessus is former managing director of the International Monetary Fund and a member of the U.N. Secretary General’s Advisory Board on Water and Sanitation. This is the first in a new series of articles for GPS by members of the Africa Progress Panel, a foundation chaired by Kofi Annan. Recent discoveries of water reserves under some of Africa’s mightiest deserts raise hopes for quenching African thirst. But the reality is much more grim. From parched desert to tropical forest, roughly 40 percent of Africans, mostly the rural poor, will not get access to clean water any time soon, a fact that exacerbates poverty, hunger, and disease. Indeed, every year, dirty water kills an estimated 750,000 African children under the age of five. And while rich countries worry about obesity, recent droughts in the Sahel and Horn of Africa have forced millions of Africans to flee their ancestral lands in search of food. 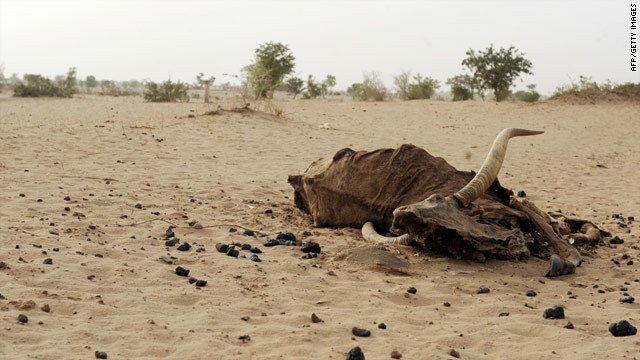 To complicate matters further, the Intergovernmental Panel on Climate Change expects climate change to hit Africa harder than anywhere else. Meanwhile, a doubling of the continent’s population in the first quarter of this century is set to significantly increase demand for Africa’s water too, risking groundwater depletion and a gradual destruction of precious ecosystems. Ahead of this year’s World Water Week, the Africa Progress Panel recommends several priorities for African water management. First, get serious about water, which is central to several critical challenges from health and hunger to energy and security. Water is more than a commodity – it’s a source of life and livelihoods. Every culture in the world recognizes water as the source of all life, and yet the international community has held back from giving access to water the prominence and backing it deserves. The United Nations took a major step forward when it officially recognized water as a fundamental human right in 2010, but aid still falls far short of the levels required to deliver clean water for all. Besides killing Africa’s children, dirty water can reduce school attendance, especially for girls, cause political instability, and constrain productivity. As we note in this year’s Africa Progress Report, Africa loses an estimated $28 billion every year through lack of access to safe drinking water and adequate sanitation. European governments realized in the 19th century that failing to invest in clean water and sanitation was the ultimate false economy. But, in urban slums across Africa, unclean water and lack of sanitation is still a source of disease. Water inequalities compound social tensions too. Poor households in the slums of cities such as Lagos or Nairobi are paying more for their water than the rich, who are served by water utilities. Unequal access means that poorer urban residents pay as much as 50 times more per liter of water than their richer neighbors. In the Nairobi slum of Kibera, for example, some of the world’s poorest people buy some of its most expensive water. Meanwhile, sprinklers water the greens of Nairobi’s nearby golf club. That brings me to the second priority. Over recent years, we have seen whole swathes of Africa’s agricultural land and water resources bought up by foreign investors. Governments in the region must stop the land grabs and put Africa’s food security front and center of their national priorities. With oil and food prices rising, many foreign investors have viewed Africa’s unused agricultural land as a high-profit opportunity for food and biofuel production. One influential recent report told investors that Africa has as many as 600 million hectares of uncultivated arable land – 60 percent of the global total. Indeed, between 2000 and 2011, Africa saw 948 land deals, covering 124 million hectares, an area larger than France, Germany, and the United Kingdom combined. Many of these land deals involve countries along the Nile and Niger rivers, whose water will be used to irrigate thirsty agricultural schemes. But for communities throughout Africa, land is more than just an economic asset. It represents life, livelihoods, culture and identity. And modern history is littered with disastrous attempts to maximize agricultural production by diverting major rivers and lakes. In the middle of a Central Asian desert, ships sit abandoned where the Aral Sea used to be before Soviet planners diverted its tributaries for cotton. Africa’s farmers and communities need protection against large-scale speculative land purchases, which often result in the eviction of smallholders, sometimes by force, and typically with minimal compensation. Such land deals should be carefully assessed and a moratorium considered until legislation can protect smallholder farmers and communities. The African Union should develop a framework for managing foreign investment in agriculture. African leaders should also invest in water management systems to reduce waste and inefficiencies. The third priority is to manage water resources in a way that takes account of the complexity of the issue, including gender, inequality, and ecosystems. Throughout Africa, women and girls often carry responsibility for a household’s water supply and sanitation. In several countries, most notably in East Africa, more than a quarter of the population spends more than half an hour per round trip to fetch water. More time finding water means less time and energy for other activities such as childcare, income generation, and school attendance. Fourth, get talking. Governments must build relationships with each other to prevent water stress from turning into conflicts. Water is the ultimate trans-boundary resource, flowing across national borders. Throughout Africa, countries share water sources such as rivers, lakes, and groundwater. Countries that build dams or invest in large-scale irrigation schemes need to recognize that their actions will have consequences downstream. As the stresses on water systems mount, the risk increases that competing claims will fuel a drift towards water wars. Indeed, land grabs have the potential to reinforce these stresses. The non-profit organization GRAIN calculates that land deals with foreign investors will require water from the Nile River to irrigate an additional 10 million hectares in five countries. The same organization quotes the U.N.’s Food and Agriculture Organization as putting the maximum irrigation potential of the entire Nile basin at 8 million hectares. More effective water management is possible. Since 1994, for example, Angola, Botswana, and Namibia have been jointly managing water use from the 1,100 kilometer Okavango River that runs through all three countries. The permanent Okavango river basin water commission (OKACOM) provides an excellent forum to help prevent cross-border water tensions from reaching boiling point. Beyond the other obvious benefits, transboundary water agreements are key to reducing the probability of water-related conflicts. The fifth priority must be new and innovative ways to finance water reform. Africa needs significantly more than the roughly $ 2.6 billion it gets at present. That may be a tall order in these fiscally straitened times. But it will be a small price to pay for investments that could protect millions from hunger, poverty, and disease and help put the world’s poorest region on a pathway to greater self-reliance. Reading the stories regarding the many lives affected by lack of clean drinking water is heartbreaking. I feel obligated to reach as many of these sites as possible to make people aware of a solution. We already have the product in Puerto Rico and they are thrilled by it. It is very safe and used at very small amounts. 30ml cleans 1200 Liters of bacteria and pathogen water. Please see our product here and let me know if you have any questions.